How much does it cost to travel to Monterey? How much money will you need in Monterey? $111 is the average daily price for traveling in Monterey. The average price of food for one day is $38. The average price of a hotel for a couple is $112. Additional pricing is in the table below. These average travel prices have been collected from other travelers to help you plan your own travel budget. When it comes to California, Monterey may not be mentioned half as much as you hear about Los Angeles or San Francisco, but it is a beautiful city to visit, with a diverse expanse of exciting and relaxing things to do, whether you're looking for adventure, a quiet getaway, or romance. Located on California's central coast, the city of Monterey was the first State Capital of California. It was also home to many artists, athletes, and musicians, such as John Steinbeck, Clint Eastwood, and Ron Johnson. Monterey has mediterranean climate with mild winters and warm, dry summers. Cold season runs from December to April and warm season, from July until October. The peak travel seasons are during summer, from July to September. If you want to avoid crowds, the months of April and October are ideal times to visit for fewer crowds and comfortable weather. Monterey is heavy with both Spanish and Mexican heritage as easily seen in the architecture of the Monterey Old Town Historic District. If you haven't planned out your trip, stop by the Visitor's Center for information about events and points of interest, including historical landmarks like the Presidio Chapel, the Cooper Ladera Adobe house, and Colton Hall, the building where California became a state and the first California constitution was written. Some of the main attractions of Monterey are at the waterfront. Stroll down Fisherman's Wharf for souvenir shops, art galleries, restaurants, and bars on the way to observe the seals laying out on the Coast Guard Pier. Rent a bike, a surrey, or simply walk north on the 18-mile-long paved Recreation Trail from the wharf to Cannery Row, made famous by John Steinbeck's book with the same name. Monterey was the sardine capital of the world in the 1930s and today, restaurants, shops and hotels occupy the former canning facilities. While you're there, search for seaglass at Macabee Beach and check out the starfish, anemones and other sealife in the tidepools at Saint Carlos Beach. 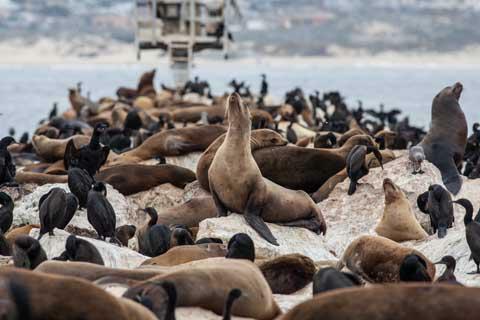 If you continue north on the recreation trail, you'll come across the Monterey Bay Aquarium, where visitors can see and learn about thousands of different species of animals. The aquarium is great for kids and hands-on fun with a 40-foot long touch pool to interact with different plants and sealife local to the bay. Further north on the Recreation Trail is Lover's Point, popular for sailing the rocky shores, swimming, and taking in the beautiful view from the peaceful and romantic park. Get in your car for one of the most scenic drives in the world on the iconic 17-mile drive for views of the Lone Cypress,Point Joe, Fanshell Overlook, the Spanish Bay, and Pebble Beach. Monterey is a dog-friendly city and you'll be sure to come across plenty of dog-friendly hotels. Dogs are also welcome off leash at Del Monte Beach, where you can end your evening with a bonfire in the fire pits under the night sky. Another great place to visit which is not far from Monterey and other nearby coastal towns is the new Pinnacles National Park. With a rental car or camper van, reaching this park only takes about 3 to 3.5 hours. This beautiful natural area is full of peaks, forest, and wildlife. For more information, check out this great guide to Pinnacles National Park. Monterey has some interesting neighborhoods to explore. The downtown area has a high concentration of historic buildings. Alvarado Street is the main street through the area and this is where you'll find the highest concentration of restaurants, bars, and shops. Cannery Row is where you'll find the aquarium as well as many restaurants with local seafood. Adjacent to the downtown area is Old Town. This area can be further divided into two sections. The southern section is defined by the intersection of Madison and Pacific Streets and the northern section borders the bay. Del Monte Beach is to the east. If you're looking for active things to do, you'll be sure to find plenty to do. From whale-watching tours to fishing trips to harbor cruises, there are lots of tour operators and charter boats to take you out to sea. During high tide, surfing is an amazing experience for beginner and seasoned surfers alike, and it's not uncommon to experience sea animals that come up right up to your board. Monterey is also the perfect setting to try out other watersports, including paddle-boarding, kayaking, and skimboarding during low-tide. Scuba divers can check out the the immense kelp forests and explore "the best beach to dive in the US," as named by by Scuba Diving magazine. Those who are looking for a lower impact workout can enjoy Monterey Wine Country, named the wine-tasting destination of 2013. A Taste of Monterey on Cannery Row features wines from more than 85 local wineries. Climb aboard the Monterey Wine Trolley, which takes visitors on 3-5 hour wine tours which can take you to 3-6 different wineries (depending on the package) around town and in Carmel Valley Village, which also has a number of wine tasting rooms. Monterey Peninsula also has popular golfing spots at Pebble Beach Golf Links, Pacific Grove Golf Links, and Spyglass Hill. Meanwhile, shoppers will find a plethora of shops at Del Monte Center and around Cannery Row. For nightlife, Cannery Row and Alvarado Street are both hotspots. Lined with pubs playing live music, venues for comedy shows and intimate concerts, dance clubs, and karaoke bars, there's bound to be a nightlife scene fit for anyone, even if it's live entertainment out on the street. Thrillseekers can take advantage of Monterey's beautiful terrain as they skydive and paraglide over the Santa Lucia Mountains, sand dunes and Monterey Bay. For a local experience, check out Monterey's Farmer's Market which is open every Tuesday, rain or shine, from 4 p.m. to 8 p.m. at the Old Monterey Marketplace. - The Monterey Beer Festival and the Monterey Wine Festival, both in early June. - The Monterey Jazz Festival, one of the biggest and best jazz festivals in the world, a 3-day weekend festival which takes place each year in September. - The Redbull US Grand Prix in April. - The Big Sur Half-Marathon in mid-November. Monterey has over 150 accommodations so you'll be sure to find a fitting place to stay, whether it's a luxury 4-star hotel, bed and breakfast, inn, brand name motel, or hostel, no matter what your budget. Super budget travelers can sleep under the stars while camping at Veterans Memorial Park. You'll find no shortage of restaurants around town and while most cater specifically to tourists, they still offer fresh and delicious foods, often at a good price. Seafood specialties in the area include clam chowder in sourdough bread, abalone, calamari, and Dungeness crab. Sanddabs are a local seafood that is typically fried. There are plenty of excellent seafood restaurants at the Wharf and downtown. Grotto Fish Market, Old Monterey's Fish House, and Sea Harvest Fish Market are all contenders for the title of the best clam chowder around. The Poke Lab is a hot new restaurant following the latest poke food trend. Diners love the ahi tuna bowl with sesame ponzu sauce. Crepes of Brittany offers delicious crepes, both savory and sweet at a budget price. Try the ever-popular caramelized onion buckwheat crepe and finish with the cooked banana crepe for dessert. For brunch with a nice price, Loulou's Griddle in the Middle is famous for its crabcakes and eggs, calamari steak, and seafood omelette. Be warned: there's usually a long wait, so arrive early. On the up side, Loulou's takes your cell phone number so you can meander the pier while you wait. Off the beaten path, Monterey's Fish House is a moderately-priced restaurant frequented by locals, who love the cioppino, crab ravioli, and oak-grilled cooking method. Restaurant 1833, though a little pricier, is a lovely place for fine-dining in a romantic and intimate setting. Menu highlights include the applewood-smoked sturgeon, roasted bone marrow, and the crowd favorite, bacon cheddar biscuits. Passionfish is Monterey's first certified green restaurant, taking pride in serving delicious food that is also sustainable and good for the planet. Passionfish draws in the crowds of fine diners with their dungeness crab salad, smoked trout, duck confit, and bread pudding. Wine lists are priced at retail, not only a bonus for your wallet, but they also keep stock of many rare wines. In addition to seafood, the area is also well known for its artichokes, which can be a wonderful option when they're in season. You can find them prepared in any number of ways including fried, grilled, boiled, or as an ingredient in other dishes. While there's no shortage of seafood restaurants, you can also easily find international options in town ranging from Thai to Mexican. While you can fly into the Monterey regional airport, which is conveniently 10 minutes away from downtown Monterey, road trips are recommended because the ride on Highway 1, aka Pacific Coast Highway, from either San Francisco or Southern California, allows you to see the beautiful scenery of the California Central Coast. By train, Amtrak Coast Starlight train runs through Salinas, up and down the Pacific Coast at various budgets. The nearest Greyhound Station for those who prefer traveling by bus is in Salinas. From Salinas, there is a free bus that can take you to downtown Monterey in 30 minutes. Within the city, during high travel season (Memorial Day through Labor Day), the Monterey-Salinas Transit offers free rides on the Wave Trolley, between various points including the aquarium, the wharf and downtown Monterey. Bike rentals are also a popular way to see and get around the city. Bay Bikes and Adventures by the Sea both offer bike and electric bike rentals. A great day trip from the San Francisco bay area is a drive through Monterey, Carmel, and then down to Big Sur. Monterey is only about 2 hours or less from San Francisco, or less from places in the southern part of the bay area. In Monterey you can stop at the pier and taste some great local seafood. This pier is touristy, but much less so than fisherman's wharf in San Francisco. From here you can book a boat if you want to go out into the bay. Further down the road in Monterey is the old cannery district, an area of historical buildings turned into shops and restuarants, and including the famous Monterey Bay Aquarium. It's worth a visit, so stop in and check out all of the indoor and outdoor exhibits. Next, drive down the highway about 20 minutes to Carmel by the Sea. It's a quaint little town with little shops and restaurants set in the trees. The main street leads down the hill to the shore where you can get out of your car and admire the Pacific. Nearby is the famous 17 mile drive which winds through beautiful coastline, expensive golf courses, and fancy houses. There is a small admission fee for this drive. If you feel short on time, skip this because the views further south along Big Sur are much better. After visiting Carmel, drive south along the highway into the area known as Big Sur. This long stretch of coastline is stunningly beautiful. The rolling green mountains spill into the rocky shoreline of blue water. Stop off at scenic spots along the way - every few miles is an overlook with a small parking lot. A few old famous arched bridges add to the backdrop. Pass Pfeiffer Big Sur park and then stop at Julia Pfeiffer Burns State Park. A small lagoon below the short walking trail has a hidden beach with an amazing waterfall. The trail leads to a quaint lookout surrounded by local trees and flowers. Further hiking can be found by going up the various trails if you have time. This is probably a good spot to turn back and drive north, unless you're spending the night further south.